It’s happened. You wake up in the morning the day after a long run and when you step foot on the floor, pain shoots up from the heel that makes you sit back on the edge of your bed. You, along with three million other Americans are suffering from plantar fasciitis. Although the condition is more common in runners like you, the chances are increased with higher body weights, flat feet or high arches, and the wearing of high heels. The good news is, plantar fasciitis is fairly easy to diagnose and treat yourself and requires minimal medical intervention. Plantar fasciitis is the inflammation of the plantar fascia, which is a thick band of tissue that connects your heel bone to your toes. The hallmark symptom is stabbing pain in the heel that is worse when standing for long periods of time or moving from a sitting or lying position to standing. Plantar fasciitis is one of the most common injuries that runners suffer from. Here, we will discuss some of the ways to treat this painful condition. In western medical practice, medications are the go-to choice for treatment of most conditions. Over the counter, non-steroidal anti-inflammatory drugs (NSAIDS) such as ibuprofen (Advil or Motrin) or naproxen (Aleve) can help reduce the inflammation to decrease the pain. If the pain is severe or persistent enough that you see your medical provider, they may prescribe a steroid to reduce inflammation and help promote tissue growth and repair. Rest: stop using the body part or doing things that aggravate the injury. For plantar fasciitis, that means no running, jumping, or wearing of high heels until the pain subsides completely. When the pain is gone and you resume normal activity, you should pay close attention and avoid things that caused the issue to begin with. Ice: apply ice to your foot several times a day for 15 to 20 minutes at a time. Never apply the ice directly to the skin. Ice helps to alleviate pain and reduce inflammation. Compression: wearing a brace, supportive sock, or comfortable sneakers can help to reduce swelling and support the injured area. Elevation: elevate your foot and leg when possible to help reduce swelling and pain. Early movement: although it is recommended to rest the injured area, you should not completely reduce movement. Many people have increased pain first thing in the morning due to the lack of movement overnight while they were sleeping. Stretching the area, light massage, and supported walking can help prevent the area from tightening up or continuing to swell. Support is essential to both preventing plantar fasciitis and treating it. Wearing a brace, splint, or supportive shoes helps to support the arch of your foot and the ligaments within. High heels, shoes without arch support, and old or worn out shoes can both cause plantar fasciitis and worsen existing problems. Especially while running, or other high-impact activities, or standing for long periods of time, you should wear supportive shoes with arch and ankle support. Limit wearing high heels, sandals, and other flat-footed shoes if you walk or stand most of the day. Your physician may also recommend shoe inserts or special orthotics. If the symptoms are bad enough, you may also benefit from a walking cast, boot, or night splints. Therapies such as physical therapy, stretching, and massage can make a significant difference in reducing pain and inflammation and repairing the area. Physical therapists offer a wide range of stretches and exercises that can help repair and strengthen the area. Stretching is important before high-impact exercise to help prevent injury as well as reduce pain and recover. Massage can be as simple as using your foot to roll a tennis ball around or as involved as a professional massage — either feels great! Of course, with any injury or persistent pain, it is advised for you to visit your primary care physician (PCP). 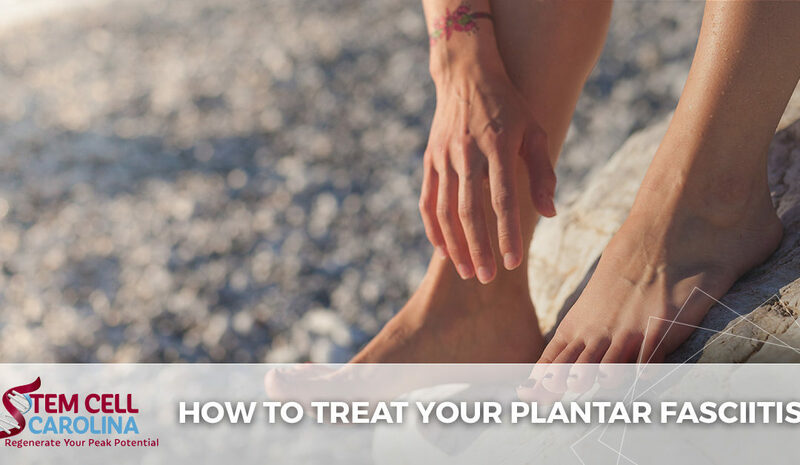 While there is little diagnostic testing they will do for plantar fasciitis, and they may simply recommend the self-care treatments we have listed here, they can also rule out other possible diagnosis or problems and recommend treatments based on reoccurrence or severity. Depending on how bad the symptoms are, your PCP may refer you to a podiatrist, or sports medicine specialist. When more conservative treatment options are not working or you have recurring bouts of plantar fasciitis, your doctor may recommend a surgical option. Steroid injections are commonly used but have been known to weaken the plantar fascia. Extracorporeal shock wave therapy is the use of sound waves directed at the area of pain to penetrate deep tissues to stimulate healing. Tenex procedure is a minimally-invasive procedure that removes scar tissue buildup on the plantar fascia to reduce pain and help improve flexibility. Surgery is recommended in some extreme cases where all else fails. In surgery, the plantar fascia is detached from the heel bone, which causes a weakening in the arch of the foot, but reduces the pain. More recently, advances in technology and development of advanced regenerative medicine techniques have led to safer, more reliable treatment options for plantar fasciitis. Platelet-rich plasma (PRP) therapy uses plasma that is taken from the patient. The plasma is fractionated to increase the concentration of platelets in the fluid. This platelet-concentrated plasma is then injected into the foot of the patient. The platelets help recruit stem cells and promote collagen formation. PRP therapy is a preferred method because it is minimally-invasive and uses the patient’s own tissues. Stem cell therapy is also a viable option for helping to repair damaged tissue and build new, healthy tissue. Stem cells are collected from the patient and then injected into the heel to target the plantar fascia. To learn more about how to avoid plantar fasciitis, read our previous article here. At Stem Cell Carolina, we offer a wide range of regenerative medicine therapies as treatment options to various injuries and ailments, including plantar fasciitis. Our specialists offer various treatment options that are tailored to your injury, lifestyle, and needs. If you suffer from persistent plantar fasciitis and stopping running is not an option you are willing to live with, contact our clinic for your evaluation today.